There might some other crochet heart pattern out there, but we prefer this delicate and "lacy" version. 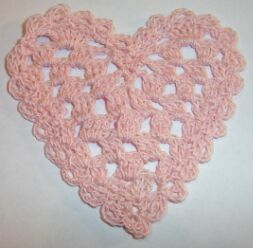 This crochet heart pattern is much more reminiscent of the old-fashion style crochet. Which makes it the perfect choice for decorating and enhancing other craft projects. If you're hoping for a really classic looking crochet heart pattern, this is definitely the one! Row 1 - Ch 3, 2 dc in 1st ch. Row 2 - Ch 3, turn, 2 dc in 1st dc, ch 2, 3 dc in top of ch-3. Row 3 - Ch 3, turn, 2 dc in 1st dc, ch 2, 3 dc in next sp, ch 2, 3 dc in top of ch-3. Row 4 - Ch 3, turn, 2 dc in 1st dc, * ch 2, 3 dc in next sp. Repeat from * one time. Ch 2, 3 dc in top of ch-3. Row 5 - Ch 3, turn, 2 dc in 1st dc, * ch 2, 3 dc in next sp. Repeat from * two times. Ch 2, 3 dc in top of ch-3. Row 6 - Ch 3, turn, 2 dc in 1st dc, * ch 2, 3 dc in next sp. Repeat from * three times. Ch 2, 3 dc in top of ch-3. Row 7 - Ch 3, turn, 2 dc in 1st dc, * ch 2, 3 dc in next sp. Repeat from * one time. Ch 3, sl st in next sp, ch 3, * 3 dc in next sp, ch 2. Repeat from * one time. 3 dc in top of ch-3. Row 8 - Ch 3, turn, 2 dc in 1st dc, * ch 2, 3 dc in next sp. Repeat from * one time. Ch 3, sl st in next sp, ch 1, sl st in next sp, ch 3, * 3 dc in next sp, ch 2. Repeat from * one time. 3 dc in top of ch-3. Row 9 - Ch 3, turn, 3 dc in next sp, ch 2, 3 dc in next sp, ch 3, sl st in next sp, ch 1, sl st in ch-1 sp, ch 1, sl st in next sp, ch 3, 3 dc in next sp, ch 2, 3 dc in next sp, dc in top of ch-3. Row 10 - Ch 3, turn, 6 dc in next sp, ch 3, sl st in next sp, ch 1, sl st in center sl st, ch 1, sl st in next sp, ch 3, 6 dc in next sp, ch 3, sk 2 dc. Sl st in next dc. Row 11 - Working in the spaces created by each of the ch-3 and dc at the beginning and end of the rows, * sc in next sp, ch 3, dc in last sc (first scallop made). Repeat from * 18 times to create a total of 19 scallops. Sk 2 dc, sc in next dc, ch 3, dc in last sc, sk 2 dc, sc in next dc, ch 3, dc in last sc, sc in next sp, ch 3, dc in last sc, sc in center sl st, ch 3, dc in last sc, sc in next sp, ** ch 3 dc in last sc, sk 2 dc, sc in next dc. Repeat from ** one time. Ch 3, dc in last sc, sc in next sp, ch 3, dc in last sc, sl st in 1st sc of row (27 scallops).